Montana State came to the Fargodome as one of the hottest FCS teams in the West. At the end of the October, many left the Bobcats for dead. 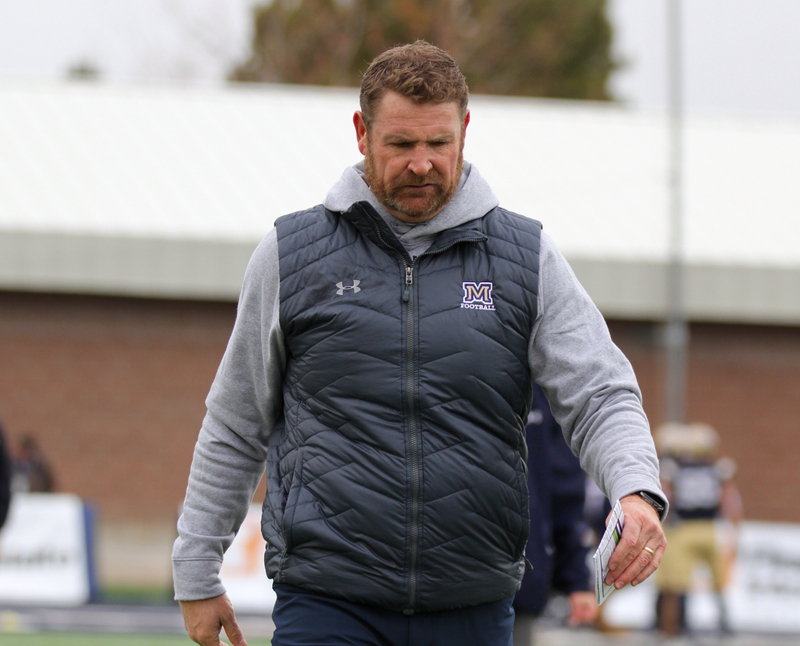 But four straight wins that included a goal line stand to beat the hated Grizzlies and the first playoff win at Montana State in six years had MSU feeling optimistic entering the Round of 16. MSU President Waded Cruzado served as an honorary captain on Saturday afternoon in Fargo, North Dakota, walking to midfield with the standard collection of MSU captains for the pre-game coin toss. The Bobcats won the toss and elected to take the ball first in one of the most fearsome venues in the Football Championship Subdivision. Montana State sophomore quarterback Troy Andersen lofted a deep pass on the first play of the game that landed right in captain Kevin Kassis’ bread basket. The junior sprinted nearly to the end-zone, diving for the pylon before being ruled down at the North Dakota State 4-yard line. MSU settled for a 24-yard field goal from junior kicker Tristan Bailey. But the Bobcats certainly threw the first punch. The problem for Montana State Saturday afternoon is that the Bison are heavyweights the caliber of Joe Louis, Rocky Marciano, Muhammad Ali or Mike Tyson. North Dakota State boxed the Bobcats into a corner with a 39-yard kickoff return to spark a scoring drive on its first possession. And the hosts threw haymaker after haymaker the rest of the first half, battering and bludgeoning the normally hard-nosed Bobcats with startling physicality, sound execution, relentless effort and a power running attack that was as advertised. By the time the first half dust settled, the only semblance of a stop earned by the Bobcat defense came after a bobbled snap led to a blocked punt that gave the Bison possession at the MSU 14. MSU held the Bison to a field goal, hardly any consolation for the drubbing Montana State found itself on the wrong end on in the second round of the FCS playoffs. 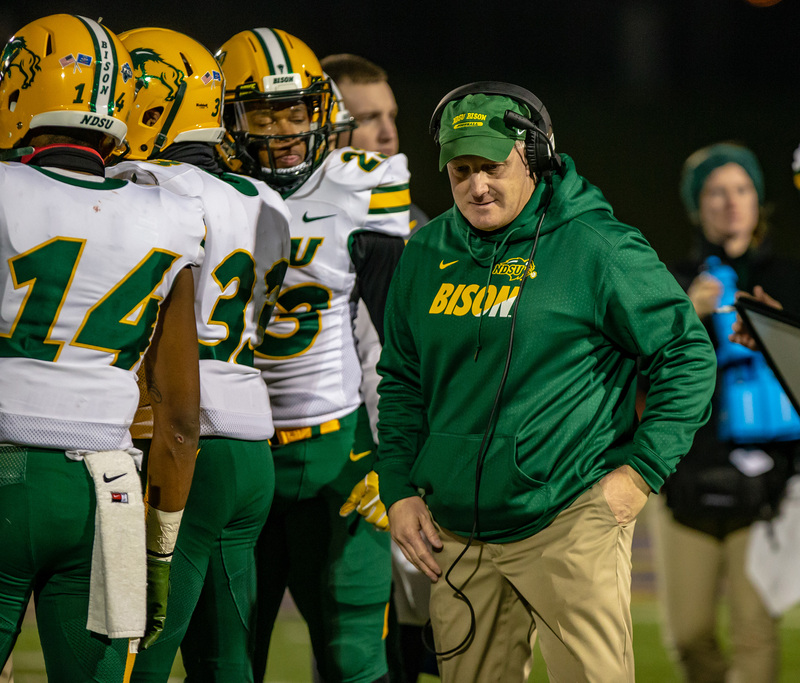 The defending national champion Bison rushed for 243 yards on just 21 carries, Lance Dunn scored four rushing touchdowns and NDSU rolled to a 38-3 advantage at halftime on the way to thorough and convincing 52-10 victory over the Bobcats. 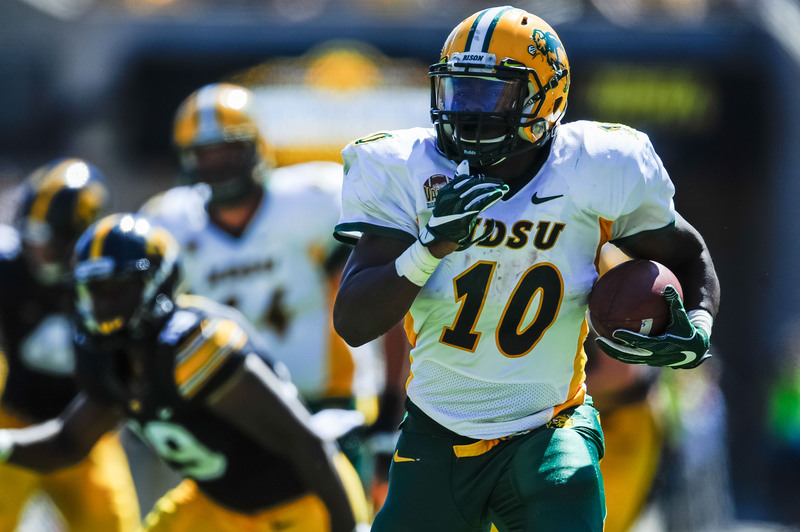 NDSU finished the afternoon with 407 rushing yards and seven rushing touchdowns. NDSU, winners of six of the last seven FCS national titles, won at the FargoDome for the 22nd time in 23 playoff games at the raucous venue. North Dakota State has now won 109 of 117 games dating back to the beginning of the 2011 season. NDSU will host No. 8 Colgate on December 8. The Raiders (10-1) used a 14-point third quarter to emerge with a 23-20 win over James Madison in the second round on Saturday. Coming out of the halftime break in Fargo, North Dakota State had the ball first. The Bobcats finally made a defensive play. Josh Hill, MSU’s fourth-year junior inside linebacker who missed the first 12 games of the season because of off-season back surgery, snared a leaping interception to end NDSU’s first second-half possession. Montana State forced a punt on the next North Dakota State and again faced a 4th & 1 from midfield. This time, Andersen pressed the hole, then turned on the jets, racing to a 51-yard touchdown. That score moved Andersen over 100 yards rushing for the ninth time this season. It also marked his 21st rushing touchdown this season, breaking the MSU single-season record held by Don Hass since 1966. Andersen’s ninth 100-yard game — he finished with 129 yards on 24 carries — broke Matt Engelking’s Montana State single-season mark dating back to 1995. 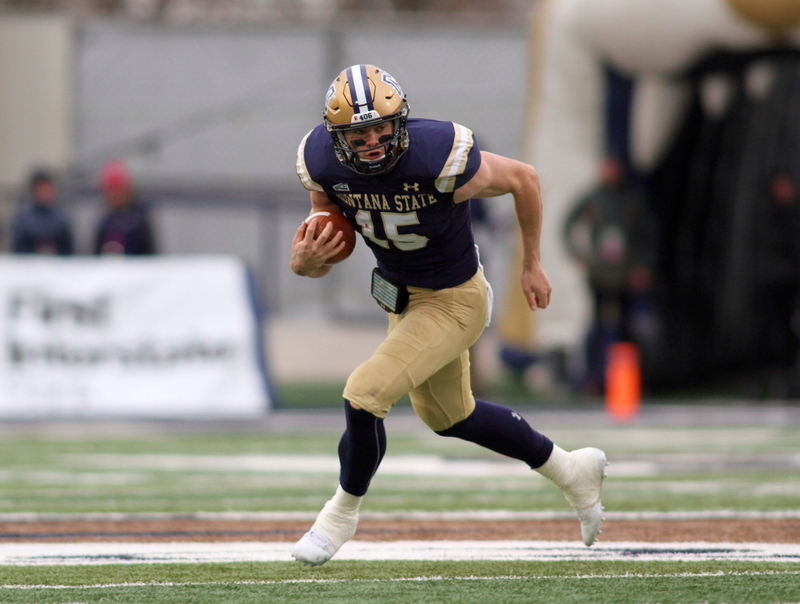 Andersen finished 2018 with 1,412 yards rushing, the third-best single-season total in school history and by far the most by a Big Sky Conference quarterback in the history of the league. Ryan Johnson holds MSU’s single-season record with 1,537 yards in 2001. 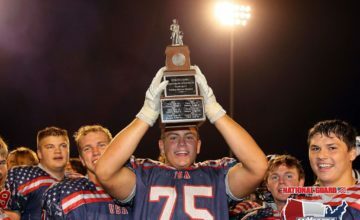 Recruited to MSU as a defensive player and the Big Sky Freshman of the Year last season while playing running back and linebacker, Andersen finished the season with 128 points, the most by a Bobcat in a single campaign. He ends his sophomore season with 1,927 yards rushing in his career, putting him alone in 11th place in MSU history. Andersen has 26 career rushing touchdowns, alone at fifth in the Bobcat record book. But Andersen’s long jaunt on a broken NDSU run fit proved to be the last spark for the Bobcat offense. North Dakota State went back to the well once again on its next possession after MSU cut the lead to 38-10. On an outside zone play, Dunn ripped off a 26-yard gain that set up Ty Brooks’ 30-yard touchdown run on the exact same play. Dunn took a seat with 127 yards on just 11 carries and the four scores. Bruce Anderson piled up 118 yards on 13 carries, including a 32-yard touchdown to push NDSU’s lead to 21-3 with 51 seconds left in the first quarter. Dunn scored from one yard out six minutes into the second quarter and from 46 yards out with 6:16 until halftime. In the second half, Brooks took over, carrying the ball six times for 103 yards, including the 30-yard score that gave NDSU a 45-10 lead with 3:33 left in the third. 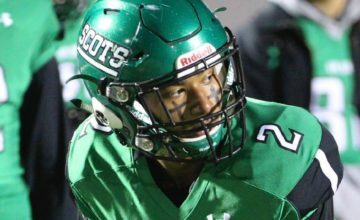 He then took a seat, giving way to Adam Cofield, a sophomore who scored the final touchdown of the game from one yard out with 10 minutes to play. NDSU rushed for 407 yards on 44 carries, averaging 9.3 yards per rush. Behind Andersen’s productive afternoon, MSU finished with 177 yards rushing on 42 carries (4.2 per rush) but managed just 301 yards of offense, 12 first downs and converted just three of 15 third downs. North Dakota State quarterback Easton Stick, a fifth-year senior who won for the 46th time in 49 starts, threw just 12 passes. He completed seven for 86 yards and only threw one pass after the interception on the second play of the second half. Montana State forced two NDSU punts after halftime but never found traction against NDSU’s run game no matter who carried the ball for the Bison. Montana State’s season ends with an 8-5 record. The Bobcats made the FCS playoffs for the fifth time this decade and the ninth time in school history. MSU is now 7-8 in the FCS playoffs. 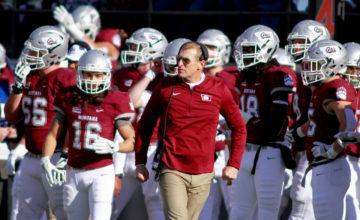 A team picked to finish eighth in the Big Sky Conference by both the league’s coaches and affiliated media went 5-3 in conference and made the playoffs for the first time since 2014. Montana State captains nose tackle Tucker Yates, defensive tackle Zach Wright and center Alex Neale along with classmates inside linebacker Grant Collins, defensive end Tyrone Fa’anono and tight ends Connor Sullivan, Curtis Amos and Wilson Brott each played their final games of their Bobcat careers on Saturday. Injured wide receivers John D’Agostino and Jabarri Johnson along with early graduating offensive lineman Colin Hammock will also move on from the football program. Junior safety Brayden Konkol finished the game with a game-high 10 tackles for Montana State. Collins notched eight stops. Hill made five tackles and the interception in his first game back since the end of the 2017 season. Jabril Cox, the 2018 Missouri Valley Football Conference Defensive Player of the Year, led North Dakota State with 10 tackles. MSU returns Andersen, Kassis and tailback Isaiah Ifanse along with five playerswith starting experience along the line on offense. The Bobcat defense welcomes back all-league defensive players Konkol, end Bryce Sterk, safety Jahque Alleyne and a collection of cornerbacks who started games over the last two seasons. But the lack of a traditional passing game once again glared Saturday. Andersen completed 6-of-17 passes for 50 yards after the long bomb on the first play of the game. Montana State opens its 2019 season at Texas Tech on August 31. Photos courtesy of NDSU athletics and by Brooks Nuanez. All Rights Reserved.